What spell-binding potions is Merlin concocting today? Fill your space with the magical, mysterious scents of aromatherapy oils, and enjoy the whimsical beauty of this wizard oil warmer/burner. 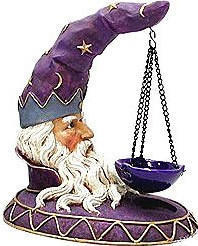 Cast in durable resin, this burner has hand-painted features and includes an oil dish suspended from the tip of Merlin's hat. Also available in black. More Photographs - Wizard Head - Purple Resin - 7.5"
End of More Photographs - Wizard Head - Purple Resin - 7.5"